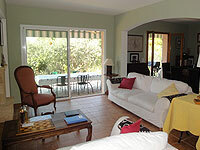 The villa reflects the character of the region, with large shuttered windows and local furnishings. It comprises a large (60 m2) south-facing drawing room with a huge French window. 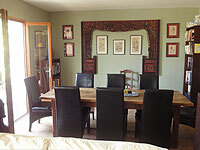 There is a separate eating area, which adjoins the kitchen. 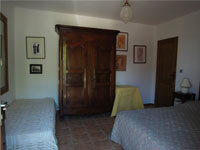 There are three double bed-rooms with direct access to two full bathrooms. 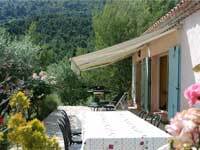 The villa is fully furnished, including bed-linen, towels, crockery, table-ware and kitchen utensils. 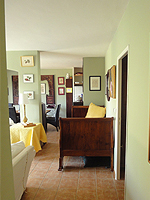 The kitchen is equipped with a gas stove, dish-washer and large refrigerator. 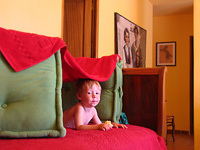 There is a washing-machine in one of the bathrooms and a satellite TV in the drawing room. 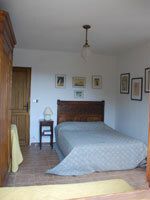 (For winter guests, there is a full fireplace, and under-floor heating throughout the villa). A 10-metre pool adjoins the patio. 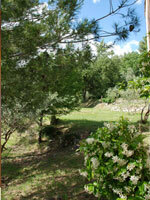 The villa is set on an acre of lush terrain up the hill from the owner’s farmhouse. 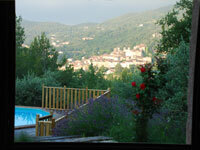 From the villa and its extensive patio, there is a commanding view of the village and the sweep of hills around it. 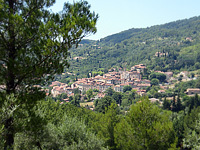 The front of the villa faces South and enjoys sunshine from morning until evening. Surrounding the villa is an olive grove, and below it a series of grassy terraces fronted with stone walls characteristic of the region. 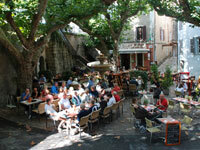 There is easy access to the villa from the Route de Mons, and a large drive leading up to the patio. 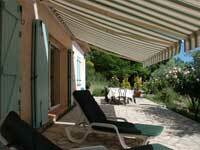 The villa is independent from the farmhouse about 150 metres away. Each offers total privacy. 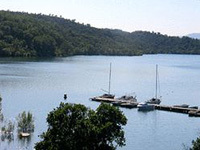 However, both properties can be rented together if several families want to share their holidays.